Hello. My name is Anne. I’m an Artist, Painter, Illustrator and Designer living in Brisbane, Australia. 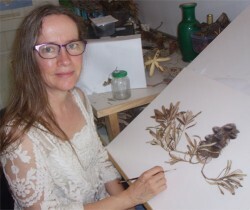 I am a botanical artist and freelance designer and illustrator. My work includes botanical illustration, storybook illustration, technical illustration, catalogue and packaging design, and social media marketing. If you want to get in touch, I’d love to hear from you. I’m available for freelance work and fine art commissions. After studying Commercial Art and receiving Folio of the Year and Honours for my Portfolio, I worked as an Illustrator within a Commercial Illustration studio in Brisbane. I learnt all about the manual skills needed to produce top quality work for the advertising, publishing, television and architectural industries. Wanting to explore my own artwork further, I moved to New Zealand and settled in Queenstown where I had my own fine art studio and produced firstly watercolours, then large scale oils. I was represented by two galleries – one in Auckland and one in Dunedin. I was invited to contribute to many exhibitions, and won many painting awards. During my time in New Zealand. I was also invited to tutor throughout the South Island, running art workshops in watercolour, oils, acrylics and drawing. After living in New Zealand for 10 years I moved back home to Australia and commenced studying Visual Communication and became familiar with the computer side of the visual art world. I earned an Advanced Diploma in Visual Communication in mid 2007 and won the Academic and Illustration awards for that year.